Looking for an all terrain snowshoes? Tubbs Mountaineer is one of the best in this category. Although looking at the big rigid crampons underneath the decking can tell you right away that it’s meant for steep climbs, this snowshoe performs surprisingly well on rolling terrain too. Deep powder performance is not as good as MSR Lightning Ascent due to heavier construction but it’s still definitely on the upper half of scale. Honestly, we think Tubbs Mountaineer has the second best flotation rating, right below the Lightning Ascent. If you’ve been wanting to know how Tubbs Mountaineer is holding up, hopefully this review can provide you with some insight. Tubbs Mountaineer comes with traditional frames constructed of aluminum tubes. This makes the snowshoes slightly heavier than typical models. However, in terms of durability, you can bet that it’s as solid as anyone would expect from a backcountry snowshoe. The size varies in three: 25, 30, and 36 inches. Along with the length, the width also increases respectively, making narrow trail walks somewhat a challenge. The good thing, however, is it boosts its flotation to the max. Tubbs Mountaineer responds incredibly well on dry snow and fresh unconsolidated corn. Deep powder performance is not as excellent as MSR Lightning Ascent but it’s easily one of snowshoes with the best flotation rating. 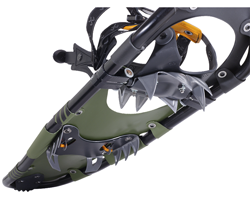 The toe crampons of Tubbs Mountaineer mimic the aggressiveness of the split teeth model in the Lightning Ascent. There’s a total of six massive carbon steel teeth right under the boot bindings, gripping tight on to the snow surface especially on hard pack and crusty icy snow. This helps considerably when you climb a steep incline. At the back, there’s a series of aluminum sharp teeth running at each side of the frames. They’re integrated with twin cleats that go on 90-degree angle from the frame. They work great as a brake as you go downhill, keeping you from tripping down. 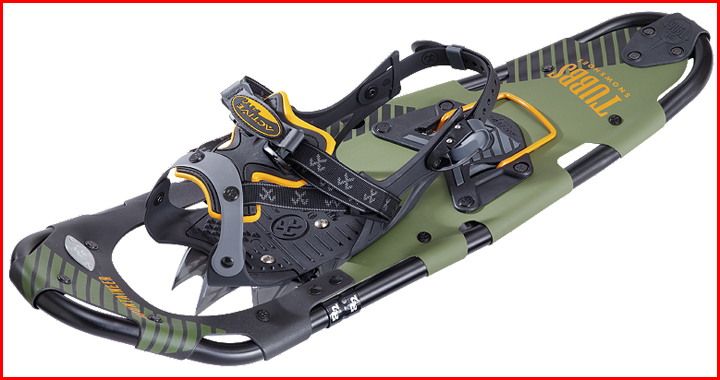 The “ActiveFit” bindings on Tubbs Mountaineer are also attached on a pivot point, just like the Lightning Ascent. They can rotate freely forward and backward without any spring-like resistance. You’ll find them convenience as you climb your way uphill but don’t expect to move quickly in them. Aside from its bulky construction, such attachment system isn’t meant to be used for fast walk. In terms of ease of use, you’ll have a hard time finding other snowshoes that can be set as quickly as Tubbs Mountaineer. There’s a large plastic curl that secure your toe box. Simply snug your boot in it, make sure you place it comfortably, then pull both straps on the opposite direction. All that’s left is tightening the heel strap which is a lot easier as it works like waist belt. Getting out is effortless as well. You just need to pull the handle in the middle upward and the twin straps will loosen. All of this can be done without removing your thick mittens. The bindings are very secure. The designers at Tubbs have really outdone themselves in the Mountaineer. Once you set all the straps, they’ll stay in place securely no matter what you throw in them. However, due to its high security, you may feel that it’s a bit too tight to comfort. That’s why the first time you place your boot under the plastic pad, make sure you fit it comfortably before pulling the straps. Because once you hold the straps in place, there isn’t much room left to wiggle. As a backcountry-oriented snowshoe, we’re glad to find it’s equipped with heel lift bars. This can reduce calf fatigue by much as you ascend by positioning your heel at better angles. It also helps the toe cleats to bite the snow more effectively, providing you with better vertical traction. Still not convinced? Find out how Tubbs Mountaineer fares compared to other snowshoes in our list Top 10 Best Snowshoes of 2017.